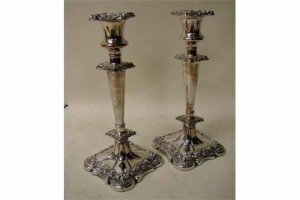 A pair of George II style silver plated candlesticks, Rococo embossed decoration, on shaped square feet. 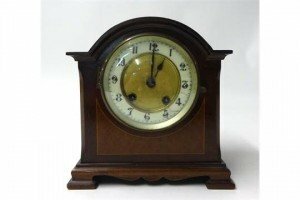 A mahogany bracket clock with striking eight day movement on a gong with pendulum, the arch top case with line inlay. 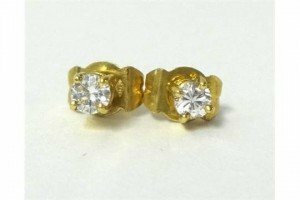 A pair of 18ct gold and diamond ear studs, claw set with brilliant cut stones of approximately 0.12 carats each. 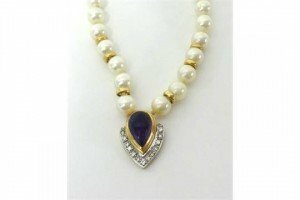 A cultured pearl, amethyst and diamond necklace, the front collet set with a pear shape amethyst bordered by brilliant cut diamonds, to a cultured pearl necklace. 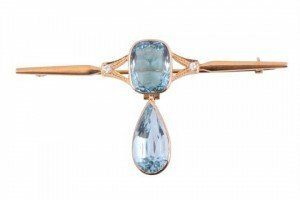 An aquamarine brooch, the cushion shaped aquamarine collet set on a polished bar, suspending a pear shaped aquamarine in a similar setting. 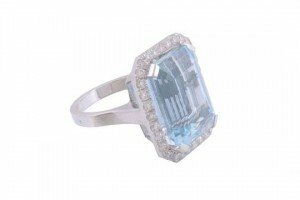 An enamel, diamond and aquamarine dress ring , the oval shaped aquamarine within a part surround of brilliant and step cut diamonds, approximately 0.70 carats total, to a blue enamelled ground. 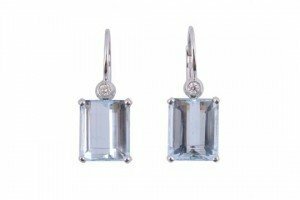 A pair of aquamarine and diamond earrings, the rectangular shaped aquamarine in a four claw setting, set below a brilliant cut diamond. An aquamarine and diamond ring, the rectangular shaped aquamarine in a four claw setting within a surround of brilliant cut diamonds, approximately 0.46 carats total, stamped 750 with Italian control marks. 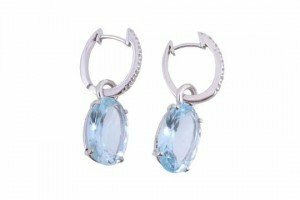 A pair of aquamarine and diamond earrings, the oval shaped aquamarine in a four claw setting suspended from brilliant cut diamond set fittings, stamped 750 with Italian control marks. 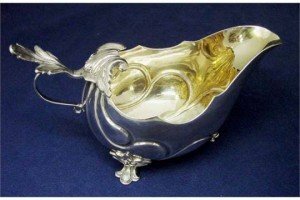 A late 19th century Swedish silver sauce boat, shaped oval form, gilt interior, loop handle with cast acanthus leaf thumb grip and three similar feet. 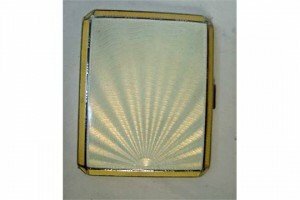 An Art Deco style silver cigarette case with yellow Guilloche enamel cover with Sunburst design, engine turned back. 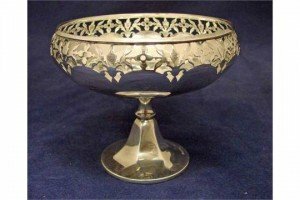 An early 20th century silver bon bon dish of pierced compressed circular form on a knopped hexagonal support and spreading circular foot. 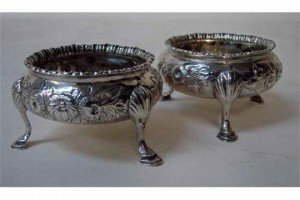 A pair of early Victorian silver salts, squat circular form, gadrooned rims, repoussé foliate decoration, set on three pad feet. 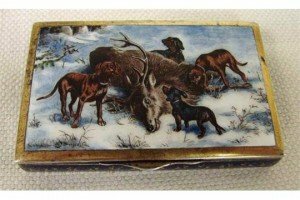 A 19th century continental silver gilt snuff box, rectangular with hinged lid decorated in enamel with hunting dogs around a fallen stag, cobalt blue and gilt enamelled sides. 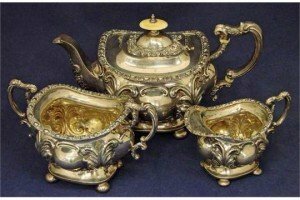 A late Victorian silver three-piece bachelor tea service by William Aitken, boat shape form, heavily decorated in a Rococo style with foliage and scroll work, consists of teapot, twin-handled saucier and cream jug, each with cast handles, supported on four bun feet. 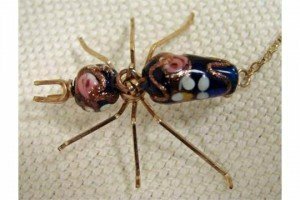 An antique fashion brooch modelled as an ant, gilt wirework construction with enamel and gilt decorated blue glass head and body. 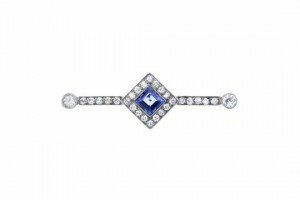 An early 20th century sapphire and diamond bar brooch. The square-shape sapphire, within a single-cut diamond surround, to the similarly-cut diamond line sides and old-cut diamond terminals. Estimated total diamond weight 0.45ct. 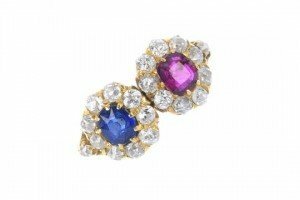 A diamond, sapphire and ruby twin cluster ring. The cushion-shape ruby, within an old-cut diamond surround, to the matching sapphire and old-cut diamond cluster, with similarly-cut diamond sides. Estimated total diamond weight 1ct. 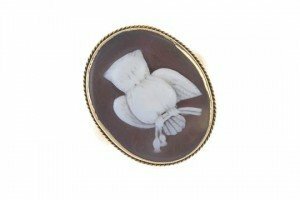 A late 19th century 15ct gold shell cameo ring. Designed as an oval-shape shell cameo carved to depict a perched owl, within a rope-twist surround, to the replacement plain band. A pair of sapphire and diamond floral earrings. 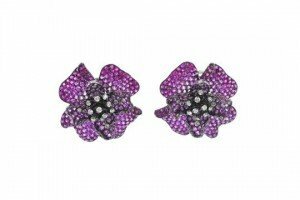 Each designed as a pink sapphire flower, highlighted with brilliant-cut diamonds. Estimated total diamond weight 1ct.